quality of the IFRS; and the perceived myths of convergence. upon by U.S. respondents to the SEC’s proposal. PAWSEY, Nicholas; BROWN, Alistair; BIKRAM, Chatterjee. The Potential Adoption of IFRS for U.S. 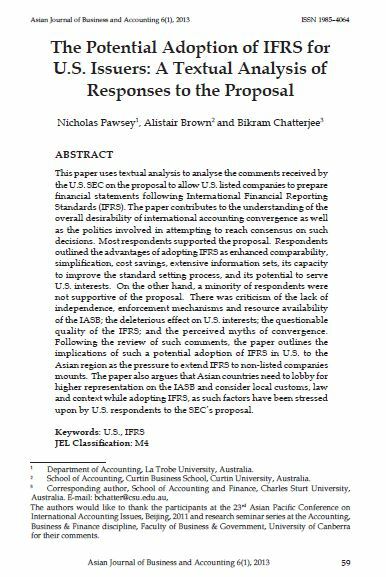 Issuers: A Textual Analysis of Responses to the Proposal. AJBA, [S.l. ], v. 6, n. 1, june 2013. ISSN 2180-3137. Available at: <https://ajba.um.edu.my/article/view/2668>. Date accessed: 25 apr. 2019.